The history of "Rotary Ann's". In many Rotary clubs throughout the world, wives of male members are affectionately called "Rotary Ann’s." This designation was never one of disparagement, but rather grew out of an interesting historical occasion. The year was 1914 when San Francisco Rotarians boarded a special train to attend the Rotary Convention being held in Houston. 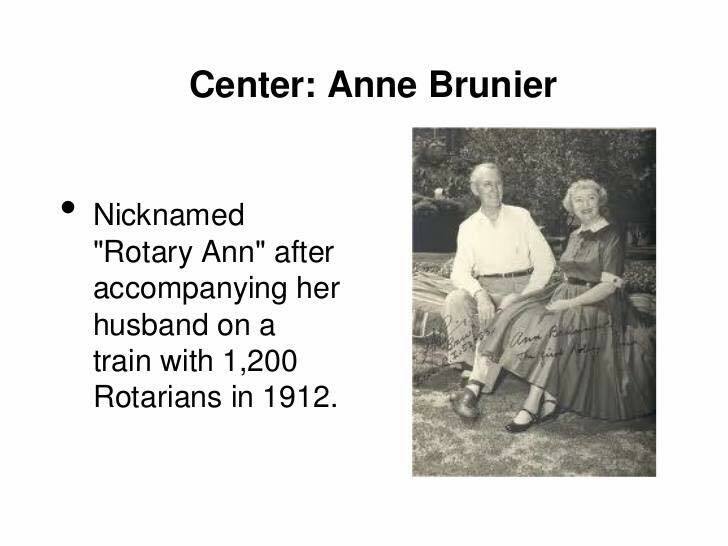 In those days few wives attended Rotary events, and until the train stopped in Los Angeles, the only woman aboard was the wife of Rotarian Bru Brunnier. As the train picked up additional convention-bound delegates, Mrs. Ann Brunnier was introduced as the Rotarian's Ann. This title soon became "Rotary Ann." Since the clubs of the West were inviting the Rotarians to hold their next convention in San Francisco, a number of songs and stunts were organized that would be performed in Houston. One of the Rotarians wrote a "Rotary Ann" chant. On the train's arrival at the Houston depot, a delegation greeted the West Coast Rotarians. One of the greeters was Guy Gundaker of Philadelphia, whose wife was also named Ann. During the rousing demonstration, someone started the Rotary Ann chant. The two petite ladies, Ann Brunnier and Ann Gundaker, were hoisted to the men's shoulders and paraded about the hall. The group loved the title given to the two women named Ann. Immediately the same term of endearment was used for all of the wives in attendance, and the name "Rotary Ann" was here to stay. Guy Gundaker became president of Rotary International in 1923 and Bru Brunnier was elected president in 1952. Thus, each of the two original Rotary Ann’s became the "first lady of Rotary International."